Cuba’s farming cooperatives constitute the dominant organizational form within Cuban agriculture. Some 3,600 cooperative farms manage about 56% of Cuba’s croplands. They grow food for national consumption and for export, and provide full-time jobs for around 300,000 cooperative members.2 They supply a variety of social benefits for members and their families: over a million people.3 But how do Cuba’s agricultural cooperatives actually function? As Cuba’s economy, and agriculture in particular, enter increasingly into world market economic competition, can these worker-managed organizations survive? After briefly recounting the history of agricultural production cooperatives in Cuba, this paper provides insight into the range of cooperative experience, based on a literature survey supplemented by details from specific agricultural production cooperatives visited by the author on several occasions. Looking toward the future, the paper addresses issues important to the sustainability of Cuba’s agricultural production cooperatives. Soon after, the National Association of Small Farmers (Asociación Nacional de Agricultores Pequeños- ANAP) initiated a somewhat more enduring effort at cooperative agricultural production. Between May 1961 and May 1962, ANAP organized 229 “agrarian societies” (Sociedades Agropecuarias or SA). These cooperatives differed from the previously established “agricultural cooperatives” and “sugarcane cooperatives” in three major ways. First, they were composed of small farmers who pooled their land in order to work it collectively, sharing draft animals and implements. 10 Second, they were much smaller than either the agricultural or sugarcane cooperatives: the average size of the 345 agrarian societies reported in August 1963 was 137 hectares, with an average membership just under 13 farmers. Finally, the SA were more democratic, with members electing their own authorities (the government appointed the managers at the agricultural and sugarcane cooperatives).11 Although over 500 SA were organized in 1962 and 1963, they failed to generate broad interest among the small farmers.12 By late 1967 only 126 remained, and four years later, the count had dropped to 41.13 Among the causes for the failure of the SA cooperative model were the timing of the effort, so soon after many small farmers had received individual land titles from the agrarian reform, and the much higher priority placed by the government on expanding the state-run agricultural sector during those years.14 In spite of the apparent failure of these “first period” production cooperatives, the experience gained would later bear fruit. Throughout the first few years of CPA development, a typical cooperative would comprise less than 30 socially homogeneous members. Thereafter, due to the entry of new members, and to a tendency to amalgamate smaller cooperatives into fewer, larger units, the average membership size grew to around 50, where it has remained.23 The social origins of the membership also became more diverse, with new members increasingly from the ranks of landless agricultural laborers, skilled workers (mechanics, welders) and professionals (accountants, agronomists). The latter category has been particularly important, with 2,750 professionals and para-professionals (técnicos medios) reported among CPA members by 1992.24 Although the presence of a core of former small farmers and their family members remained a very important characteristic of the CPAs, the tendency is for the cooperatives to become numerically dominated by the other groups mentioned. The most recent major period of cooperative formation, from September 1993 through early 1995, constitutes a reversal of the early 1960s policies that converted the agricultural and sugarcane cooperatives to state farms. 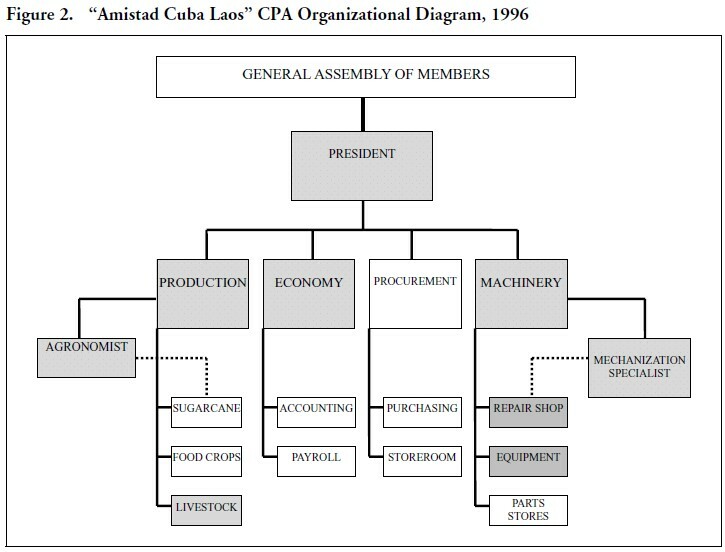 During the crisis of the early 1990s, the inefficiencies of the huge state managed farms that controlled over 85 percent of Cuba’s agricultural land area became increasingly untenable.29 Now it was the turn of the relatively more efficient CPA to provide the organizational model, just as the SA had provided the CPA direction, over 15 years earlier.30 The many lessons learned, regarding both the potential of production cooperatives and the limitations of the state-managed alternative, assured that cooperative organization would not now be as ephemeral as thirty years before. Cultivated land area, land tenure and distribution of farming population by type of farm. 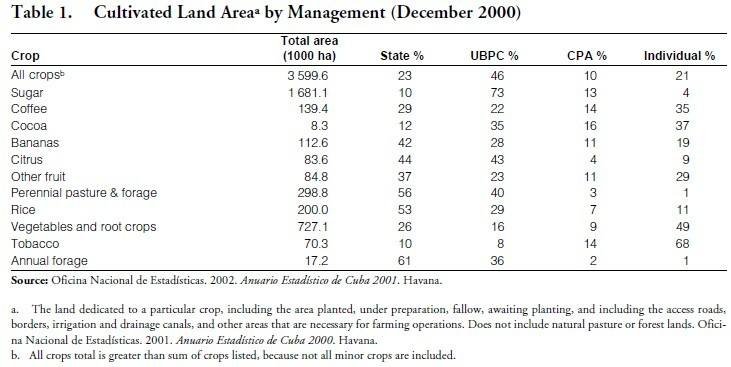 Taken together, the UBPC and CPA production cooperatives farm 56% of Cuba’s cultivated lands (Table 1). The remaining 44% is fairly evenly divided between state and individual producers. These general proportions do not provide much insight into the relative importance of each management organizational form for a particular crop. For example, sugar is heavily dominated (86%) by cooperative producers, whereas individual farms overwhelmingly manage the important tobacco crop. 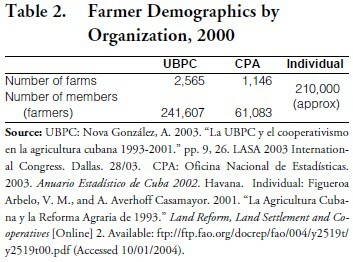 Production cooperatives also dominate Cuban agriculture demographically (Table 2). It is worth noting that much of the “Individual” sector in Tables 1 and 2 consists of credit and service cooperative members. Cuban agricultural production cooperatives are organized around government-managed purchasing, marketing and coordinating entities. In the case of sugarcane, each cane production cooperative is associated with an agro-industrial complex (complejo agro-industrial, or CAI). The CAI is owned by Ministry of Sugar, and is the most visible and active link between the state, and each sugar farm. When organized in the early 1980s, each CAI was to integrate the agricultural, industrial and transportation components of sugar production of a particular territory.42 With the formation of the UBPCs in 1993-94, sugarcane production was removed from CAI activities, but the close links to production remain. Each cooperative (UBPC or CPA), is associated with a particular CAI, which purchases and processes the farm’s cane, and supplies all major farm inputs, notably machinery, parts, fuel, lubricants, fertilizer and herbicides. Furthermore, the CAI has retained a very active role planning the annual sugarcane production plan and overseeing its progress, even though the cooperative farms have a legal claim to some degree of management autonomy. 43 Agricultural production cooperatives that produce crops besides sugarcane are similarly integrated into crop-specific state-run enterprises, under the Ministry of Agriculture, which like their counterparts in the sugar industry, purchase the bulk of cooperative production, supply nearly all inputs, and perform a range of services for the associated cooperative farms. • Cooperatives may not change from their major crop without authorization. For example, land dedicated to sugarcane must remain so, unless change is authorized by MINAZ. • Land cannot be sold or rented. It can be acquired, if the cooperative can convince a landowner to join, or to sell land to the cooperative. • The state is the principal purchaser of production. In some cases, over-quota production can be sold in farmers’ markets, but for a number of important crops, including sugarcane, the state is the only buyer. • The state is the only supplier of agricultural inputs. The cooperatives therefore have a very limited capacity to choose, vary, or often to even acquire the inputs they need. If a needed input is not available through the corresponding state supplier, it is very difficult for the cooperative to obtain it at all. In practical terms, this is probably the single most severe limitation on cooperative autonomy. According to Robert Yin, “the distinctive need for case studies arises out of the desire to understand complex social phenomena. In brief, the case study method allows investigators to retain the holistic and meaningful characteristics of real-life events—such as . . . organizational and managerial processes…” The case study is appropriate for such complex situations in part because it “copes with the technically distinctive situation in which there will be many more variables of interest than data points.”45 Two case studies carried out by the author will be used to provide specific examples in this paper. • The second case is based on multiple visits to two adjoining citrus cooperatives, also in Havana province, during 2002-03. Resources have not yet been located to carry out a formal case study at that location, so the examples reported here emerge from what might be termed a “pre-case study,” based on much less detailed data. • 876 hectares in sugarcane. • 39 hectares in food crops for members. • 39 hectares for livestock (mostly milk cows for member consumption). • 234 hectares not useable for agriculture (areas for houses, buildings, access roads, drainage ditches and especially hillsides). There were 96 members in June of 1996. The cooperative was highly mechanized, with 28 wheel tractors, 4 track-type tractors, 4 sugarcane combine harvesters, and 2 medium-duty trucks. • the remainder includes mechanics, drivers, cooks, custodial, security and other. The adjoining “9 de Abril” UBPC is also associated with the “Cítricos Ceiba” enterprise. This cooperative has a membership of around 500 (including 90 women), who farm 1,309 hectares of citrus (732 ha. grapefruit) and tend 42 casas de cultivo. The distribution of the workforce is proportionally similar to the “30 de Noviembre” cooperative. Organizational Similarities. A defining characteristic of both the CPA and UBPC is the election of cooperative directors by the membership. In both cases, the term of office is 5 years, although recall is permitted before the term expires. 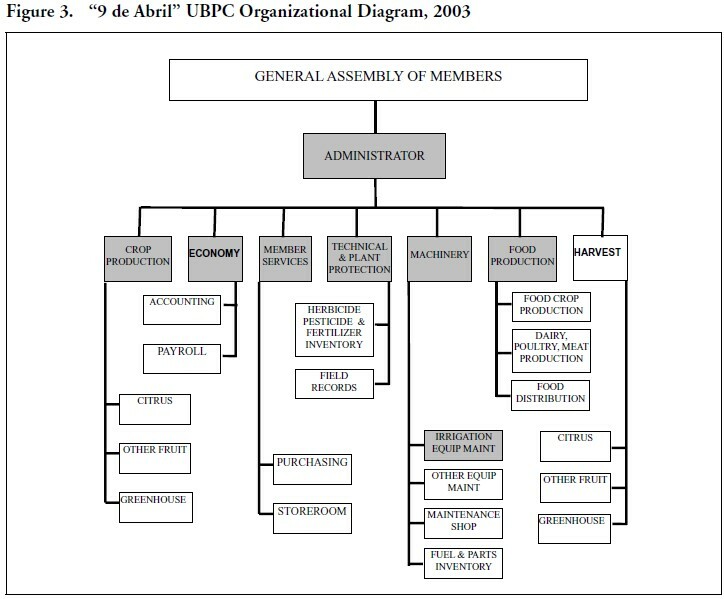 Therefore, the General Assembly (all members) is shown as the highest authority in each of the organizational diagrams (Figures 2 and 3).47 The positions occupied by members of the board of directors (CPA-junta directiva; UBPC-junta administrativa) are shaded. In both the CPA and the UBPC, the department heads are generally members of the board of directors, but each of the two cooperatives had one department head that was not included. On the other hand, each cooperative board includes some non-administrative workers among those elected. Note that the CPA includes two “staff” positions: agronomist (ingeniero agrónomo) and mechanization expert (ingeniero mecanizador). Each of these individuals has functional, but not formal, authority within a vital activity, as indicated by the dotted lines. That the CPA model served as inspiration for the UBPCs is borne out by the similarity of the organizational diagrams of these two cooperatives. There are some differences, however. The designation of the cooperative executive as “administrator” instead of president may reflect the more limited managerial autonomy available to the UBPCs. The relative importance given to “Food Production”, i.e., self-provisioning, at the UBPC is probably indicative of the origins of those cooperatives during moments of food scarcity in the early 1990s. For this reason, secure access to food was a much more important motivation for the workers who founded the UBPCs, than for the small farmers who began the CPAs under much more favorable economic circumstances. Furthermore, self-provisioning is the production area most completely under cooperative (as opposed to enterprise or ministry) management control. 48 The larger population of the UBPC, with approximately 500 members compared to about 100 at the CPA, also may influence organizational complexity. As shown in Table 3, by 2001 most of the unprofitable cooperatives, whether UBPC or CPA, were sugarcane producers. Since that time, this situation has been at least partly addressed by the downsizing of the sugar industry. 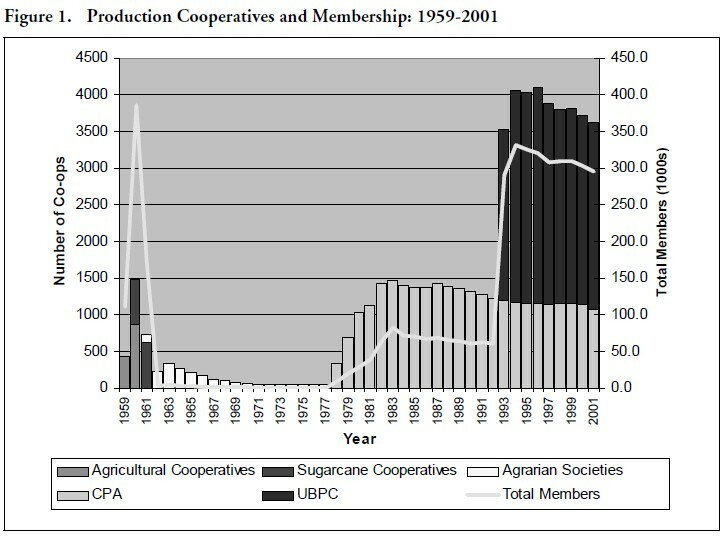 Yet, the differences in profitability between CPAs and UBPCs producing the same crops and operating within the same overall system, is an indication that it may be possible to make considerable progress toward profitability with changes in cooperative management, and possibly some changing of rules that place greater burdens on, and permit less autonomy to UBPC as compared to CPA cooperatives. Evidence from the sugarcane cooperative case study indicates, however, that sugarcane may simply be a relatively difficult crop to grow profitably in Cuba under current conditions of input scarcity, low crop price, and the negative effect on work incentives caused by the income structure described in Table 3. The “9 de Abril” UBPC provides an example of a well-implemented system of payment based on the vinculación concept, which avoids some of the distortions inherent within the payment system of the sugarcane CPA. The system described here only applies to 86 of the cooperative’s 500 members; other groups, whether the harvest crews, casa de cultivo workers, machine operators or office staff, are covered by other rules. The cooperative’s 1,309 hectares of citrus lands have been sectioned into 86 “fincas” (farms) of about 15 hectares each. Each finca is assigned to a different member of the cooperative, who is provided 4 tools: a machete, a manually actuated backpack sprayer, pruning shears, and a pruning saw. As the tool list implies, this finca caretaker, or finquero, is responsible for controlling weeds, pruning each tree, placement of irrigation tubes, and maintaining a presence to avoid theft of fruit or equipment. The finquero also oversees operations that are performed on the finca by other cooperative members: fertilizer application by the mechanization group, and harvest by specialized fruit-picking crews. As is the case with the sugarcane CPA, each finquero is paid a periodic advance on earnings. Unlike the CPA however, endof- year payment (after the harvest) is not based on days worked throughout the year, but on the amount of fruit harvested, with the price paid per unit weight increasing on a sliding scale as production per hectare (yield) increases. In this way, income of each finquero is directly related to the productive results of his/her work. The citrus UBPC also has a food production area, the output from which is sold to the membership at low prices. Although we do not have sufficient data to perform a quantitative comparison of the contribution of each income source to the overall member income, a finquero from the neighboring “10 de Noviembre” UBPC reported yields of 17 metric tons per hectare (which he said are slightly below average), and annual earnings of 7,300 pesos, or 608 per month, during 2002. The cooperative reports that a few finqueros earned double this amount. These were (and are) relatively good incomes in Cuba, where a high-level administrator or professional might have received less than 500 pesos per month at that time. This accounts for the presence of some skilled workers and even professionals among the finqueros. Most importantly, there is a clear relation between effective effort, and income. In 1993-94, the Valencia orange yield was barely 2 tons per hectare, from trees largely covered by vines. Figure 4 shows the production increase partially credited to the finquero system, as well as losses related to hurricane Michele of November 2001. Based on these descriptions, it is tempting to conclude that the vinculación system described at the citrus UBPC represents a solution to the apparent problems related to payment, incentive and motivation described at the sugarcane cooperative. However, due to substantial operational and economic differences between citrus and sugarcane production systems in Cuba, a direct comparison of these two cooperatives is difficult. Rather, the two systems illustrate a portion of the heterogeneity of specific practices present among contemporary Cuban agricultural production cooperatives. The ability of these cooperatives to creatively adapt their management systems to changing social, technical and especially economic conditions will to a large extent determine the sustainability of these unusual farms. Another requirement for consistent improvements in economic performance is a functioning cost accounting system. The system described for the citrus UBPCs takes no account of either input costs, or fruit quality in calculating payment to the finqueros. It was implemented to rapidly raise production from the abysmal levels of the years following the collapse of the USSR and Eastern Bloc. For the 2002-03 season, the Valencia orange yield at the “10 de Noviembre” farm was 22.5 t/ha, a vast improvement, but around 10 t/ha short of average Valencia yields in Florida. 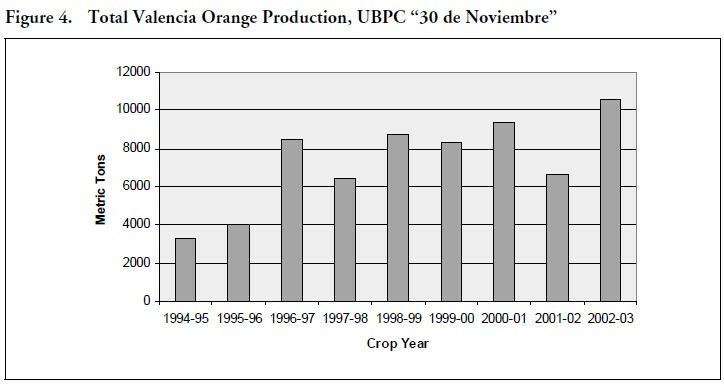 Grapefruit yields are more important for the “9 de Abril” UBPC, and at 35.3 t/ha, are also well short of the “potential” represented by Florida’s 44 t/ ha average grapefruit production. Part of this “yield gap” is caused by a continuing shortage of chemical inputs, particularly fertilizer. Chronic input shortages have been a way of life in Cuban agriculture since the collapse of the USSR/socialist bloc. These shortages explain why little attention within the incentive system has been given to cost of inputs: the finqueros tend to use all the inputs they are provided. With yield maximization as the goal, little would be gained by accounting for the costs of these inputs, which are rationed at sub-optimal quantities. Nevertheless, as input shortages are gradually resolved, cost accounting is becoming a priority.59 Unfortunately, several factors tend to complicate the calculation of production costs in Cuba: the lack of a market-determined currency exchange rate; the nonmarket aspects of Cuba’s economic system; increasingly diverse farming operations on the cooperatives; and a long history of disregard for cost accounting within the context of Cuba’s planned economy. Prominent Cuban economists argue for significantly greater reliance on agricultural input markets, including credit.60 Under the current system of input rationing by the state enterprises, even when a cooperative accumulates profits, it can be very difficult to invest in production, since there are no markets for inputs, machinery, or building supplies. Even limited movement toward agricultural input markets would constitute a very significant and, for most Cuban observers, positive development for the cooperative agricultural production sector. Some apparent limitations to greater participation are readily identified, and can be classified according to the ability the cooperative has to affect that limitation. First, member participation takes place within the framework of cooperative autonomy. A clear distinction should be made between the autonomy of the cooperative to manage its affairs, and member participation in cooperative decision-making. Even the highest levels of enterprise autonomy do little to assure worker participation, as exemplified by the tremendous autonomy within a capitalist economy of private firms, whose workers have almost no ability to participate in meaningful decision-making. Yet clearly a production entity must be permitted some degree of decision autonomy, if members are to be involved in decision-making. While Cuban agricultural production cooperatives are subject to considerable limits on their autonomy (see below), it seems very clear that additional space for member participation in decision-making exists. Participation is also inhibited by the manner in which cooperatives themselves manage information. At the “Amistad Cuba Laos” sugarcane cooperative, a crucial, post-harvest general assembly (all members) meeting is held in July. Among other business, the draft annual report is presented to the membership. This report is a multi-page document that includes narrative, and numerous 5 and 6-digit figures referring to each of the cooperative’s areas of economic activity. After the economic officer reads the report aloud, the floor is opened for discussion and possible modification, and the document, as modified, is eventually approved by a show of hands. According to the economic officer himself, no written materials, either handouts or wall charts, are prepared to aid the membership in the analysis and evaluation of their annual report. There are indications that cooperative members would respond well to accessible, written materials of this nature. Making quantitative indicators of cooperative performance more readily available for analysis and decision-making by the cooperative rank-and-file would certainly promote informed participation. At the root of the tension between top-down management and cooperative autonomy may be divergent interpretations of the function of the agricultural production cooperative in Cuba. Prior to 1993, the CPAs were closely integrated into an overwhelmingly state-dominated structure of production, while the UBPCs had not yet been carved out of the large, centrally managed state-run enterprises. The role of state agencies as sole purchasers of farm production and sole suppliers of farm inputs constituted a fundamental limit to autonomous economic action, even for the CPAs. With the establishment of the UBPCs, the opening of agricultural markets with prices determined by supply and demand, and a declining ability of state entities to guarantee adequate supplies of production inputs, the structural differentiation between the cooperatively managed production and the state enterprises has increased. But the state agencies associated with each cooperative still constitute the principal purchasers of output, and near-monopoly suppliers of inputs. These factors clearly limit management autonomy, regardless that the farm is internally structured as a cooperative. 63 These management limitations raise the question of the actual function of the cooperatives. The UBPCs in particular are still considered by some state administrators to be productive units whose success is quite simply determined by the care with which they follow Ministry technical recommendations, such as fertilizer application rates and planting schedules. In contrast, cooperative leaders and other members increasingly see their farms as collectively run businesses. 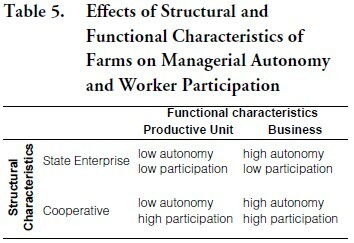 These dualities of structure and function help explain the persistence of top-down methods in the relations between cooperatives and state entities, as well as the resistance to those methods.64 Table 5 shows the effects on managerial autonomy and worker (member) participation that combinations of these structural and functional dualities tend to engender. Assuming that the gradual trend within Cuba continues toward more decentralized, economic- based decision-making, there is reason to believe that the conditions favoring both high autonomy and high participation may eventually be achieved. To what extent might the increased emphasis on individual effort and reward inherent in the vinculación management (as illustrated with the citrus finquero example) tend to reduce the commitment to the collective as a whole, and possibly even lead to a voluntary de-collectivization of production? Although this is a difficult question to evaluate, observations during several visits during recent years to the “10 de Noviembre” and “9 de Abril” citrus cooperatives suggest that the sense of group identity and member solidarity at the cooperative is strong, and even increasing. This impression is based partly on the maintenance and expansion of the cooperatives’ common resources: the child daycare center, the selfprovisioning (food production) efforts, improvement to the dormitory-style housing for members who are not local residents, and a large new covered area for meetings, meals and other group activities. Furthermore, conversations with members give little or no indication of a desire to “go it alone.” To the contrary, there appears to be an awareness of the advantages of being part of a large operation, particularly one in which they have a “voice and vote” and one which both rewards individual effort, and defends against hardship beyond individual control. In the end, an increased focus on individual effort and reward that generates success may be less of a threat to the cooperative unity and member solidarity, than a more egalitarian system that is economically stagnant. With respect to work itself, the cooperatives we have examined are typical in that they rely heavily on modern technologies, especially agricultural and transport machinery. Various factors have been identified that inhibit individual small farmer participation in modern technologies.66 Among such technologies, machinery is a particularly important component of collective farming operations, and one that is not easily divided or shared if a decision is taken to parcel-out the cooperative. Poor utilization of agricultural machinery in Cuba during the 1970s and 1980s, combined with very limited import capacity during the Special Period, has led to criticism of machinery’s ecological and economic costs, as compared to human or animal-powered alternatives. 67 Of more immediate concern to laboring cooperative members however is machinery’s ability to alleviate drudgery,68 an aspect of mechanization that is difficult for economists to evaluate.69 Alternatives to machine power may have other costs such as truncated education (on-farm child labor) or transfer of croplands to grazing or fodder land (animal power).70 Finally, some types of mechanization appeal to low income farmers specifically because they reduce severe risks, i.e., machine-powered irrigation pumps where drought is common, or tractor-drawn tillage where weather patterns provide a short window of opportunity for field preparation. One further consideration when evaluating the prospects for voluntary de-collectivization, or parceling, of the cooperatives is that the overwhelming majority of current members of production cooperatives have no experience with individual family farming. Avoiding negative environmental impacts is certainly as relevant to the sustainability of Cuban agricultural production cooperatives as it is to farms in any part of the world. Sulroca et al. report that cooperatives are particularly effective in assuring environmentally responsible practices, stating that 90% of their lands are prepared using minimum tillage techniques, that industrial organic byproducts have replaced substantial amounts of inorganic fertilizer, and that they are using biological pest and disease control on their crops.73 In contrast, at least one case study in Cuba found small, individually managed family farms to have lower environmental impact than the production cooperatives. The cooperatives were able to more creatively blend traditional and modern agricultural practices, however.74 The protected cultivation (casas de cultivo) found at the “10 de Noviembre” and “9 de Abril” citrus cooperatives seems to be an attempt to substitute a physical barrier, and labor-intensive attention for high levels of pesticides often required for production of “tourist quality” vegetables in the tropics. At the same cooperatives, citrus pests presence is monitored through traps placed at various points across several cooperative farms. Checking and maintaining these traps is part of duties of some (not all) finqueros, whose reports are consolidated by cooperative and Ministry of Agriculture specialists. This type of system would be extremely difficult for individual family farmers to manage. In some cases the chronic input shortages have led to high level of chemical-use efficiency. The citrus groves visited at the “10 de Noviembre” and “9 de Abril” cooperatives were practically weed-free. Herbicides application is one of the jobs of the finqueros, and is accomplished with a back-pack sprayer on a weed-by-weed basis. The per-hectare expense for herbicides is said to be less than $50, about 25% of typical per-hectare herbicide expenditures in Florida. At the same time, members of the “Amistad Cuba Laos” CPA listened patiently as they were encouraged to replace their tractors with oxen in the mid- 1990s. Although they readily agreed that there were a few tasks that the oxen could handle around the cooperative, they were not practical for any major substitution of tractors in cane work. First, they noted, which lands should we dedicate to animal forage instead of sugar production? Next, since the cooperative is nearly 10 kilometers long, the oxen would have to be kept in several areas around the cooperative. Cattle rustling was a serious problem, so each group of oxen would require constant guarding, and of course the guards as well as the animals would require infrastructure: housing and corrals. Guard duty would represent a non-productive drain on the cooperative. Similarly, there were pressures from the government to substitute organic sugar mill by-products for inorganic fertilizers. Undoubtedly some fertilizer could be saved, but the logistics of transporting and distributing the per hectare recommendation of 35 tons of filter cake and 25 tons of ash,75 are daunting in contemporary Cuba. The state still directly manages about 20% of Cuba’s agricultural lands. Might a substantial part of this area be organized into production cooperatives? Probably not, at least in the short-term. The single largest remaining state agricultural production enterprise, the citrus development at Jagüey Grande, Matanzas, consistently achieves some of the highest citrus yields in the country. To the extent that the Cuban government is currently shifting land out of state management there is a preference to supply very small (less than 1 hectare) areas to families. However, over the longer run, the possibility of converting significant state managed lands to cooperatives cannot be discounted. Intensive urban agriculture areas, known as huertos intensivos or organopónicos, constitute a rapidly growing source of fresh vegetables and condiments in Cuba.78 There were 12,598 of these urban agriculture areas reported to exist in Cuba at the end of 2002.79 Although many are attached to workplaces, some are organized as production cooperatives. In the city of Havana alone, between 1994 and 2000 the number of urban agriculture UBPCs increased from zero to 178, with plans to organize over 100 more.80 A particularly successful example is the “UBPC Organopónico Vivero Alamar.” Founded with only 5 members in January of 1997, within 5 years the cooperative provided employment for over 50 members on less than 4 hectares of land nestled between residential areas in Habana del Este. These UBPCs represent an extension of cooperative structures into urban areas. As urban agricultural cooperatives become more common, might the cooperative idea spread to other productive or service activities, such as construction, tourism or manufacturing? Finally, the Cuban state may decide to divest more of its current functions to cooperatives. According to several Cuban analysts, 2nd-level cooperative organizations, whose members would be the CPA or UBPC production cooperatives, as well as credit and service cooperatives, could become suppliers of inputs and services, and sellers of agricultural products to nongovernmental entities.81 Such a development could broaden cooperative autonomy by introducing farm input markets and expanding markets for farm production, and extend cooperative autonomy, into new commercial and service arenas. 1. This is a revised version of a paper presented at the “Whither Goes Cuba?” symposium, Iowa University, February 6-7, 2004. 2. Numbers refer to CPA and UBPC cooperatives (see below), calculated from Nova González, A. 2003. “La UBPC y el cooperativismo en la agricultura cubana 1993-2001.” p. 18, 22, 25. LASA 2003 International Congress. Dallas. 28/03, plus urban farming cooperatives from González Novo, M. 2000, April. “Institucionalización de la Agricultura Urbana en Ciudad de la Habana.” In: Red Latinoamericana de Investigaciones en Agricultura Urbana – AGUILA [Online]. Available: http://www.ipes.org/aguila/publicaciones/ Resumen%20Habana.htm (Accessed 20-01-2004). 3. Álvarez, M. D. 2002. “Social organization and sustainability of small farm agriculture in Cuba.” p. 80. In F. Funes, L. García, M. Bourque, N. Pérez, and P. Rosset (eds.) Sustainable agriculture and resistance: transforming food production in Cuba. Food First Books, Oakland, CA. 4. The historical section draws heavily on an earlier work Royce, F., W. Messina, Jr., and J. Alvarez. 1997. “An empirical study of income and performance incentives on a Cuban sugarcane CPA.” p. 457-471. In Cuba in Transition—Volume 7. Association for the Study of the Cuban Economy, Washington. 5. Reed, E. P. 1977. “Introducing group farming in less developed countries: some issues.” p. 360. In P. Dorner (ed.) Cooperative and commune. University of Wisconsin, Madison, Wisconsin. 6. Royce, Messina, and Alvarez. 1997. p. 458. 7. Bianchi, A. 1964. Chapter 3. Agriculture: post revolutionary development. p. 105. In D. Seers, A. Bianchi, R. Jolly, and M. Nolff (eds.) Cuba: the economic and social revolution. University of North Carolina Press, Chapel Hill, North Carolina. 8. Bianchi, A. 1964. p. 108. 9. Domínguez, J. I. 1978. Cuba: order and revolution. Belknap Press of Harvard University, Cambridge, Massachusetts; Dumont, R. 1970. Cuba: socialism and development. Grove Press, New York; Bianchi, A. 1964. p. 107. 10. Martín Barrios, A. 1987. La ANAP: 25 años de trabajo. Editora Política, Havana, Cuba. 11. Bianchi, A. 1964. p. 106, 127. 12. Regalado, A. 1979. Las luchas campesinas en Cuba. Editorial Orbe, Havana. 13. Domínguez, J. I. 1978; Martín Barrios, A. 1987. 14. Figueroa Arbelo, V. 1997. “Cooperativización del campesinado en Cuba: evolución y expectativas.” p. 7. In N. Pérez Rojas, E. González Mastrapa, and M. García Aguilar (eds.) Cooperativismo rural y participación social. Universidad de la Habana, Havana. 15. Deere, C. D., M. Meurs, and N. Pérez. 1992. “Toward a periodization of the Cuban collectivization process: changing incentives and peasant response.” Cuban Studies 22: 120; Zimbalist, A., and S. Eckstein. 1987. “Patterns of Cuban development: the first twentyfive years.” World Development 15(1): 7. 16. Martín Barrios, A. 1987. 17. Deere, C. D., and N. Pérez. 1999. “Cuba: successful voluntary collectivization.” p. 200-201. In M. Meurs (ed.) Many shades of red. Rowman & Littlefield, Inc., Lanham, Maryland.18. Asamblea Nacional del Poder Popular. 2002. “Ley de cooperativas de producción agropecuaria y de créditos y servicios.” (Ley No. 95). Gaceta Oficial 72: Capítulo II, Artículo 5. 19. Martín Barrios, A. 1987. 20. Deere, C. D., and N. Pérez. 1999. pp. 185-186. 21. Deere, C. D., M. Meurs, and N. Pérez. 1992. p. 121; Ghai, D., C. Kay, and P. Peek. 1988. Labour and development in rural Cuba. St. Martin’s Press, New York; Asamblea Nacional del Poder Popular. 1982. “Ley de cooperativas agropecuarias.” (Ley No. 36). Gaceta Oficial 63: Articulo 25. 22. Figueroa Arbelo 1997: p. 2. 23. Deere, C. D., M. Meurs, and N. Pérez. 1992. p. 123. 24. Arias Guevara, M. d. l. A., and N. Castro Hermidas. 1997. “Un enfoque socio-clasista hacia el interior del movimiento cooperativo.” p. 30. In N. Pérez Rojas, E. González Mastrapa, and M. Garcia Aguilar (eds.) Cooperativismo rural y participación social. Universidad de la Habana, Havana. 25. Figueroa Arbelo, V. 1997. p. 10. 26. Oficina Nacional de Estadísticas. 2001. Anuario Estadístico de Cuba 2000. Havana. 27. Figueroa Arbelo, V. 1997. p. 17. 28. Deere, C. D., and N. Pérez. 1999. pp. 214-218. 29. Alvarez, J., and L. Peña Castellanos. 2001. Cuba’s sugar industry. University Press of Florida, Gainesville. 30. Alvarez, J., and L. Peña Castellanos. 2001. 31. Deere, C. D., N. Pérez Rojas, C. Torres Vila, M. García Aguilar, and E. González Mastrapa. 1998. Güines, Santo Domingo y Majibacoa: sobre sus historias agrarias. Editorial de Ciencias Sociales, Habana; Burchardt, H.-J. 2000. “La descentralización de las granjas estatales en Cuba: ¿Gérmen para una reforma empresarial pendiente?” p. 174. Cuba in Transition—Volume 10. Association for the Study of the Cuban Economy, Washington; Enríquez, L. J. 2003. “Economic reform and repeasantization in post-1990 Cuba.” Latin American Research Review 38,1. p. 204. 32. Valdés Paz, J. 1997. Procesos agrarios en Cuba 1959-1995. Editorial de Ciencias Sociales, Havana. 33. Figueroa Arbelo, V. M., and A. Averhoff Casamayor. 2001. “La Agricultura Cubana y la Reforma Agraria de 1993.” Land Reform, Land Settlement and Cooperatives [Online] 2. Available: ftp://ftp.fao.org/docrep/fao/004/y2519t/y2519t00.pdf (Accessed 10/01/2004). 34. Compare the first two years of CPA formation (1977-79), which resulted in 10,829 farmers in 428 cooperatives Martín Barrios, A. 1987., to the number of UBPCs organized in the similar period as described above. 35. Deere, C. D. 1995. “The new agrarian reforms.” NACLA Report on the Americas 29(2, Sept/Oct): 14. 36. Bianchi, A. 1964. p. 108. 37. Alvarez, J. 2004, January. In: The Current Restructuring of Cuba’s Sugar Agroindustry [Online]. Available: http://edis.ifas.ufl.edu/ pdffiles/FE/FE47200.pdf; Peters, P. 2003. Cutting losses: Cuba downsizes its sugar industry. Lexington Institute, Arlington, Virginia. http:// www.lexingtoninstitute.org/cuba/SugarpaperFinalPDF.pdf. 38. MINAZ. 2003. Informe resumen de los resultados alcanzados por la UBPC cañeras en el período 1993-2003. Ministerio del Azúcar / Sindicato Nacional de Trabajadores Azucareros. Ministerio del Azúcar, Havana. 31/Oct. 12. 39. MINAZ. 2003. 40. Peters, P. 2003; Sulroca, F., R. Quintero, and J. C. Figueroa. 2004. “Las cooperativas en la agricultura cañera cubana.” p. 5. Seminario de las Cátedras Azucareras de las Universidades Cubanas. Universidad de la Habana, Havana. 10/Jun. 42. Alvarez, J., and L. Peña Castellanos. 2001. 43. Comité Ejecutivo del Consejo de Ministros. 1993. Acuerdo 2708. 21/Sep. 44. Alvarez, J., and L. Peña Castellanos. 2001. Nova González, A. 2004. “Redimensionamiento y diversificacion de la agroindustria azucarera cubana.” p. 20. Seminario de las Cátedras Azucareras de las Universidades Cubanas. Universidad de la Habana, Havana. 10/ Jun; Rodríguez Castellón, S. 2000. “Las Unidades Básicas de Producción Coperativa. El plan y el mercado.” pp. 196-199. In H.-J. Burchardt (ed.) La última reforma agraria del siglo: La agricultura cubana entre el cambio y el estancamiento. Nueva Sociedad, Caracas, Venezuela; Sexto, L. 1995. S”er o no ser autónomas, esa es la cuestión.” Bohemia 87(8, 9/95): B27-B29. 45. Yin, R. K. 2003. Case study research: design and methods. Sage Publications, Inc., Thousand Oaks, California. 46. Royce, F. S. 1996. Cooperative agricultural operations management on a Cuban sugarcane farm : .”.and everything gets done anyway.” (M.S. thesis). p. 172. University of Florida, Gainesville. http://www.cubanag.ifas.ufl.edu/pdf/Royce.PDF; Royce, F., W. Messina, Jr., and J. Alvarez. 1997. 47. The “9 de Abril” UBPC is used in this example. 48. Pérez Rojas, N., and D. Echevarría León. 2000. “Participación y autonomía en las UBPC.” p. 159. In H.-J. Burchardt (ed.) La última reforma agraria del siglo: La agricultura cubana entre el cambio y el estancamiento. Nueva Sociedad, Caracas, Venezuela. 49. Deininger, K. 1995. Collective agricultural production: A solution for transition economies? World Development, Vol. 23, No. 8: 1317-1334. 50. Nova González, A. 2003. La UBPC y el cooperativismo en la agricultura cubana 1993-2001. Cuadro 10. LASA 2003 International Congress. Dallas. 28/03. 51. Buró Político. 1993. “Acuerdo del Buró Político : Para llevar a cabo importantes innovaciones en la agricultura estatal.” Granma, 15/Sep. Havana. 52. Royce, F. S. 1996. pp. 85-94. 53. A fuller discussion is found in Royce, F., W. Messina, Jr., and J. Alvarez. 1997. 55. Pérez Rojas, N., and D. Echevarría León. 1998. “Políticas diferenciales para la promoción de la producción.” p. 119. In N. Pérez Rojas, E. González Mastrapa, and M. Garcia Aguilar (eds.) Campesinado y participación social. Universidad de la Habana, Havana. 56. Pérez Rojas, N., and D. Echevarría León. 1998. 57. Torres Vila, C., E. González, N. Niurka Pérez Rojas, and M. García. 1996. “Estudios de caso de dos UBPC cañeras de Güines: Análisis comparativo.” p. 81. In N. Pérez Rojas, E. González Mastrapa, and M. García Aguilar (eds.) UBPC: Desarrollo rural y participación. Universidad de la Habana, Havana; Deere, C. D., N. Pérez Rojas, C. Torres Vila, M. Garcia Aguilar, and E. González Mastrapa. 1998. p. 71. 58. Pérez Rojas, N., and D. Echevarría León. 1998. p. 121; Arias Guevara, M. A., and R. Hernández Benítez. 1996. “Cooperativas con obreros agrícolas: autogestión y sentido de propiedad.” p. 132. In N. Pérez Rojas, E. González Mastrapa, and M. García Aguilar (eds.) UBPC: Desarrollo rural y participación. Universidad de la Habana, Havana. 59. The author has observed keen interest and enthusiasm for improved cost accounting procedures at these and all other cooperatives visited in Cuba. 60. Bu Wong, A., P. Fernández, A. Nova, A. García, and A. Atienza. 1996. “Las UBPC y su necesario perfeccionamiento.” Cuba: Investigación económica (INIE) 2: 36-37; Nova González, A. 2003. p. 15. 61. Carnoy, M., and D. Shearer. 1980. Economic democracy. M.E. Sharpe Inc., White Plains, N.Y; Koont, S., and A. Zimbalist. 1984. “Incentives and elicitation schemes: a critique and an extension.” p. 172. In A. Zimbalist (ed.) Comparative economic systems: an assessment of knowledge, theory and method. Kluwer-Nijhoff Publishing, Boston; Manz, C. C., and H. P. J. Sims. 1987. “Leading workers to lead themselves: the external leadership of self-managing work teams.” Administrative Science Quarterly 32(1): 118-121; Prychitko, D. L., and J. Vanek. 1996. “Introduction.” p. xviii. In D. L. Prychitko, and J. Vanek (eds.) Producer cooperatives and labor-managed systems: case studies. Edward Elgar Publishing, Ltd., Cheltenham, UK. 62. At least one other study indicates that this situation may be common among Cuban CPAs: “Moreover, it seems that even within the degree of autonomy retained by cooperatives, many have failed to consolidate participatory management styles and collective decision making.” Deere, C. D., M. Meurs, and N. Pérez. 1992. p. 139. 63. Bu Wong, A., P. Fernández, A. Nova, A. García, and A. Atienza. 1996. p. 27; Valdés Paz, J. 1997. Procesos agrarios en Cuba 1959- 1995. Editorial de Ciencias Sociales, Havana. 64. Burchardt, H. J. 2000. “La última reforma agraria del siglo: cambio o estancamiento.” p. 176. In H.-J. Burchardt (ed.) La última reforma agraria del siglo: La agricultura cubana entre el cambio y el estancamiento. Nueva Sociedad, Caracas, Venezuela. 65. Figueroa Arbelo, V. 1997. p. 2. 66. Carter, M. R., and B. L. Barham. 1996. “Level of playing fields and laissez faire: postliberal development strategy in inegalitarian agrarian economies.” World Development 24(7, July): 1138. 67. García Aguilar, M. 2000. “Prácticas productivas y ecológicas en las UBPC. Realidades y desafíos. Estudios de casos.” pp. 238-239. In H.-J. Burchardt (ed.) La última reforma agraria del siglo: La agricultura cubana entre el cambio y el estancamiento. Nueva Sociedad, Caracas, Venezuela; Ríos, A., and F. Ponce. 2002. “Mechanization, animal traction, and sustainable agriculture.” pp. 156-160. In F. Funes, L. García, M. Bourque, N. Pérez, and P. Rosset (eds.) Sustainable agriculture and resistance : transforming food production in Cuba. Food First Books, Oakland, CA. 68. Crossley, P., J. Kilgour, and J. Morris. 1983. Small farm mechanization for developing countries. John Wiley & Sons, Ltd., Norwich, England; Stout, B. A. 1990. Handbook of energy for world agriculture. Elsevier Science Publishers Ltd., Essex, England, UK. 69. Campbell, J. K. 1990. Dibble sticks, donkeys and diesels. International Rice Institute, Manila, Philippines. 70. Pingali, P., Y. Bigot, and H. Binswanger. 1987. Agricultural mechanization and the evolution of farming systems in sub-Saharan Africa. Johns Hopkins University Press, Baltimore. 71. For China see Meisner, M. 1996. The Deng Xiaoping Era: an inquiry into the fate of Chinese socialism. Hill & Wang, New York; Shue, V. 1988. The reach of the state. Stanford University Press, Stanford, California; for Vietnam see Utting, P. 1992. “From orthodoxy to reform: historical experiences of post-revolutionary societies.” Third World Quarterly 13(1): 45; for Peru see Rojas Senisse, H. 1993. Perú: de exportador a importador de azúcar. Instituto Peruano del Azúcar, Lima, Perú; McClintock, C. 1981. Peasant cooperatives and political change in Peru. Princeton University Press, Princeton, N.J; for Mexico see Martínez Ramírez, J. A., and J. J. Rojas Herrera. 2003. “Panorama del Sector Cooperativo Mexicano.” Unircoop [Online] 1(2). Available: http://www.unircoop.org/documents/revue/ Release/Vol1No2.11.Unircoop.Mexique.pdf (Accessed 12/07/04); Eckstein, S. 1966. El ejido colectivo en México. Fondo de Cultura Económica, Mexico, D.F. Examining Peruvian, Chilean and Mexican experiences, Cynthia McClintock suggests an explanation to this apparent paradox: Third World governments are challenged by the political assertiveness emerging from the self-managed enterprises they have created. McClintock, C. 1981. 72. MINAZ. 2003; Peters, P. 2003. 73. Sulroca, F., R. Quintero, and J. C. Figueroa. 2004. p. 14. Production cooperatives may have an important role in providing the organizational basis for local stewardship or “landcare” of vulnerable natural resources. Ruben, R. 1999. Making cooperatives work: contract choice and resource management within land reform cooperatives in Honduras. CEDLA, Amsterdam. Ruben’s suggestions are particularly interesting in the Cuban context, with an abundance of both cooperatives, and environmentally fragile areas in need of protection. 74. Sáez, H. 1997. “Property rights, technology, and land degradation: a case study of Santo Domingo, Cuba.” p. 480-484. Cuba in Transition—Volume 7. Association for the Study of the Cuban Economy. Washington. 75. Rodríguez Castellón, C. S. 2004. “El potencial de desarrollo de la agricultura cañera cubana sobre bases sustentables.” p. 6-7. Seminario de las Cátedras Azucareras de las Universidades Cubanas. Universidad de la Habana, Havana. 10/Jun. The 35 t/ha rate is localizada or targeted to the plant uptake areas of the field. A broadcast rate recommendation is 120-240 t/ha. See Treto, E., M. García, R. Martínez Viera, and J. M. Febles. 2002. “Advances in organic soil management.” p. 167. In F. Funes, L. García, M. Bourque, N. Pérez, and P. Rosset (eds.) Sustainable agriculture and resistance: transforming food production in Cuba. Food First Books, Oakland, CA. This task would be further complicated if oxen were specified for hauling and/or application. 77. Arias Guevara, M. A., and R. Hernández Benítez. 1996. pp. 132-134; Figueras Matos, D., L. Fajardo Nápoles, and G. Donéstevez Sánchez. 1999. “La fuerza de trabajo colectiva: experiencias en las Cooperativas de Producción Agropecuarias de la provincia de Villa Clara.” p. 160. In N. Pérez Rojas, E. González Mastrapa, and M. García Aguilar (eds.) Participación social y formas organizativas de la agricultura. Universidad de la Habana, Havana; Valdés Paz, J. 1997. For an example of how group differences in attitude can be generated by policies within a single cooperative, see Royce, F. S. 1996. 78. Companioni, N., Y. Ojeda Hernández, E. Páez, and C. Murphey. 2002. “The growth of urban agriculture.” pp. 228-229. In F. Funes, L. García, M. Bourque, N. Pérez, and P. Rosset (eds.) Sustainable agriculture and resistance: transforming food production in Cuba. Food First Books, Oakland, CA; Murphy, C. 1999. “Cultivating Havana: urban agriculture and food security in the years of crisis.” pp. 24-27. In Development Report. Vol. 12. Institute for Food and Developemnt Policy, Oakland, California. 79. Madruga, A. 2003. “Acercar los Alimentos a la Mesa.” Granma 8/24. Available: http://www.granma.cubaweb.cu/secciones/aniversario/ articulo18.htm#inicio (Accessed 26/01/2003). 80. González Novo, M. 2000. 81. Pérez Villanueva, E. 2000. “La reestructuración de la economía cubana. El proceso en la agricultura.” p. 93. In H.-J. Burchardt (ed.) La última reforma agraria del siglo: La agricultura cubana entre el cambio y el estancamiento. Nueva Sociedad, Caracas, Venezuela; Villegas Chádez, R. 1999. “Sobre la necesidad de la intercooperación e integración agroindustrual en las UBPC.” pp. 66-68. In N. Pérez Rojas, E. González Mastrapa, and M. Garcia Aguilar (eds.) Participación social y formas organizativas de la agricultura. Universidad de la Habana, Havana; Sulroca, F. 2004.